A new exhibition by Brooklyn-based artist Kate Steciw will be on show at Higher Pictures, New York, from September 10 and will run through October 12, 2016. This is the artist’s second solo exhibition with the gallery. The exhibition features a new series of sculptures from the artist. Steciw continues to explore the way in which anonymous images are part of a cycle of emptying out, accumulation, and transformation from one digital platform to various other mediums. She utilizes her own images alongside hired ones. 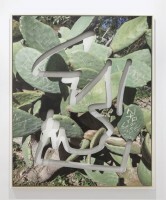 The artist uses her signature geometric cut outs, colored Plexiglas overlays, chains, and stickers. These appear as digital doodles, which Steciw draws directly onto the image. Steciw’s images are all an attempt to reclaim the anonymous or personal with a purposeful rebellious touch.